The first espresso machine, which Angelo Moriondo invented in the late 19th century, looked something right out of a steampunk movie. Espresso machines of the modern era look nothing like Angelo’s creation. But, we think he’d be happy to see how the espresso machine has evolved in design, capability, and popularity. The espresso machine is making its way into an increasing number of homes every year. And now, you want one for your home. 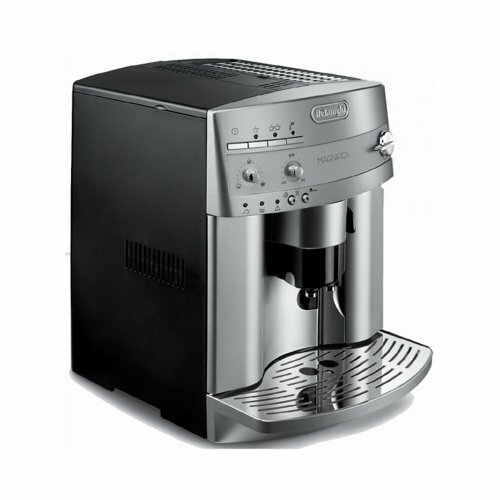 But, choosing the best home espresso machine for your requirements and budget is no easy task. The difficulty stems from two reasons. First, the capability of a machine scales upward with cost. The more you pay, the better the features you get. More often than not, prospective customers find it hard to decide where to draw the line. The second reason why it’s difficult to shop for an espresso machine is the variety of configurations that various brands and models offer. So, to buy and enjoy an espresso machine, you should be able to compare what you want with what the products offer. This requires a good understanding and knowledge. That’s why we’ve created this comprehensive guide. The first part of the guide contains home espresso machine reviews. The purpose of this section is to introduce you to the leading products in this segment. This way, you are familiar with what the market has to offer. Then, in the next section, we will help you understand the important factors to consider when buying a home espresso machine. This section will help you frame your own requirements clearly. Using the information in the two sections, you can easily choose the right machine for your needs. 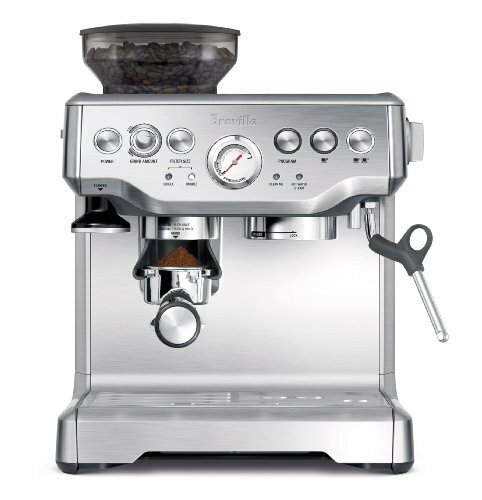 The Barista Express from Breville is a semi-automatic espresso machine. It is an Amazon bestseller and has hundreds of favorable reviews to its credit. Suitable for beginners and experts alike, this coffee brewer has excellent features for its price. So, let’s look at the details of what this machine has to offer. Yes, the machine does not have a boiler. So, you cannot brew and steam at the same time. But, the Barista Express uses a thermo coil system that reduces the time taken to switch between brewing and steaming. And, the system has a PID temperature regulator that maintains the heat between 195° F and 205° F, which is the ideal range for extraction. The machine also has an auto-purge steam wand. The auto-purge function cleans the steam wand after each function and also cools the thermo coil from steaming temperature to boiling temperature. And, after extracting coffee, the machine leaves behind a dry puck in the portafilter. This makes it easy to clean the machine. Overall, if you’re a fan of semi-automatics, then the Barista Express is a wonderful option to consider. The DeLonghi Magnifica is a super-automatic coffee machine. It has a built-in burr grinder that allows you to set the grind size. The panel has two rotary knobs. One for setting the espresso length and the other for setting the espresso strength. After making these selections, you can choose to make either a single shot or a double shot. And, that’s where your role ends and the machine’s role begins. The conical burr grinder automatically grinds the right amount of coffee into the filter basket in the brew head. Then, the machine automatically goes through the pre-infusion and brewing cycle to give you a crema-rich espresso. Now, if you like milk drinks, you can use the steam wand to froth milk and pour a cup of latte or cappuccino. Also, the machine has two thermal blocks – one for steaming and one for brewing. So, you can switch from brewing to steaming instantly. The patented Cappuccino system mixes steam and milk in the right proportion to produce rich and creamy froth. In other words, this machine delivers barista-quality drink on a consistent basis – even if you don’t have any experience in brewing espresso. While the Breville Barista Express gives importance to control, the DeLonghi Magnifica stresses convenience. So, you really can’t say one is better than the other. It depends on what you’re looking for in a machine. If you have no interest in learning, honing, and mastering barista skills, get the DeLonghi Magnifica. Otherwise, go for a semi-automatic. 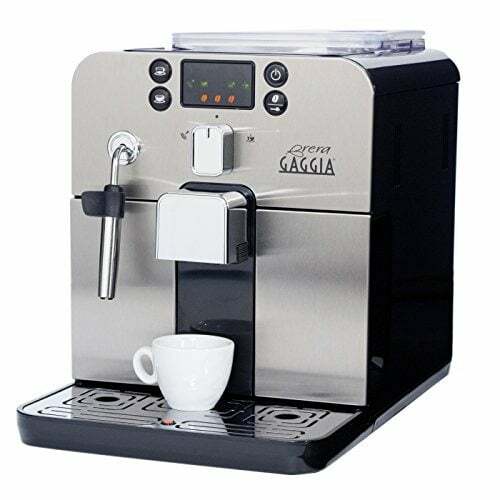 The Gaggia Brera is another amazing super-automatic espresso machine. Available in silver and black, the Brera is as stylish as it is easy to use. Described as a “bean-to-cup” brewer, this super-automatic has a built-in flat ceramic burr grinder. And, you can select the grind size to get the perfect beach sand texture. Once you set the grind size, you can select the strength and volume of the shot. Thereafter, the machine will grind the right amount of coffee into the filter and transition to the pre-infusion cycle. After pre-infusion, the machine pours the espresso through the height-adjustable brew head. If you don’t want to use the grinder, you can use the bypass doser. This is ideal for brewing decaf or flavored coffee. After pulling the espresso shot, you could brew yourself a latte or a cappuccino by frothing milk on the pannarello steaming wand. Even though this machine has a thermo block system, its Rapid Steam technology reduces the transition time between brewing and steaming. And, the pannarello wand allows you to create rich and foamy milk even if you don’t know the right technique for frothing milk. If you compare the Brera with the Magnifica, you’ll see that the two machines offer almost the same number of controls. But, the Magnifica offers a better degree of control. For example, the Brera has three strength settings – light, medium, and strong. But, the Magnifica has five settings. However, the Brera is also around a hundred dollars cheaper than the Magnifica. All the products we’ve discussed so far are in the $400+ range. What if you don’t have that kind of budget and you still want great espresso? Well, the Mr. Coffee ECMP1000 presents a viable solution. It’s a #1 bestseller on Amazon and has hundreds of favorable reviews. In other words, this machine is affordable and popular. One thing that’s missing in this semi-automatic espresso maker is a built-in grinder. However, this machine has an automatic milk frother. So, after you dose, tamp, and insert the portafilter, you can select the drink and amount of froth. Then, the machine does the rest. The machine has a pre-programmed setting for espresso, cappuccino, and latte. There’s also a dial above the milk carafe to change the amount of froth. After use, you can run the clean cycle to purge the frother. Then, you can remove the milk carafe and store it in the fridge, or you can dispose the remaining milk and clean the carafe. But, since this machine does not come with a grinder, you may need to buy one separately. Since the machine is so reasonably priced, there’s enough wiggle room to accommodate a grinder as well. So, the missing grinder isn’t a big issue. The way we see it, the Mr. Coffee ECMP1000 is best for people who appreciate a good espresso or latte and are not obsessive about the finesse. If you’re particular about controlling temperature, pre-infusion time, grind size, dosing, and tamping, you should consider buying a more expensive semi-automatic brewer. 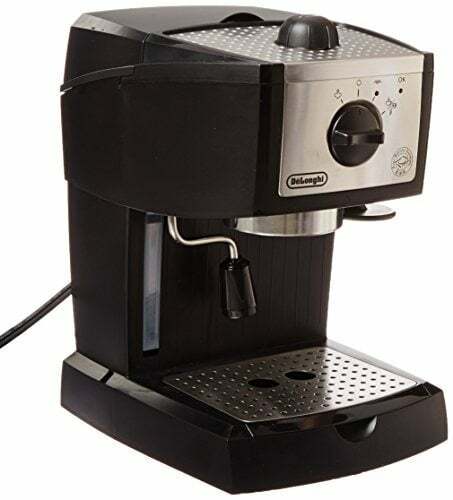 If you’re looking for an espresso machine that’s very basic, the DeLonghi EC155 is the best bet. 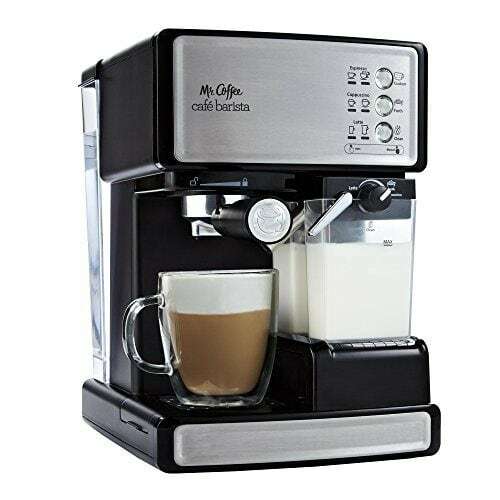 It’s the best budget espresso machine because it costs under $100 while letting you brew espresso and milk drinks at home. But, considering the low price tag, you should prepare to live with some limitations. So, let’s go over the haves and have-nots of this product. Since the EC155 is a semi-automatic, you will need to dose and tamp the portafilter yourself. After preparing the portafilter and attaching it to the group head, you can turn the knob on the machine to start brewing your espresso. Once the machine finishes pre-infusion and brewing, you get a cup of delicious espresso. Now, you can use the steam wand to froth milk and make yourself a latte or a cappuccino. The machine has separate thermostats for steaming and brewing. So, the time to switch between the two functions is not very long. However, the frother has limited capabilities and produces limited results. In other words, you can make a latte, but not the best latte. According to us, you will receive the most from this machine if you’re an espresso-only type of person. To make quality milk drinks, you’ll need a separate milk frother. Buying a coffee grinder will also improve the taste of your espresso. In summary, the EC155 is great for people who are more picky about the price than the taste and versatility. When you set out to buy a home espresso machine, you encounter many products across different price brackets. With many products vying for your attention at the same time, confusion sets in. And, you know that any decision that a muddled mind makes is not the best one. So, this section is dedicated to enabling you to approach the process with a clear head. First, we will help you get clear on the two types of espresso makers. Thereafter, we will look at important factors to consider for each type. Finally, the section will point you to notable brands in this space. So, if you’re ready to identify, buy, and enjoy the best home espresso maker for your budget and requirements, let’s dive in. From beans to coffee, the brewing process involves these steps: grinding, dosing, tamping, pre-infusing, and pouring. Each step involves technicalities. For example, grinding involves setting the right grind size, dosing involves weighing the right amount of coffee, and tamping involves applying the right amount of pressure. A skilled barista spends years working on mastering each step. So, we have a question for you – are you interested in mastering all these steps? If you said “Yes,” you need a semi-automatic. Every semi-automatic gives you control over dosing and tamping. Semi-automatics with a grinder allow you to tweak the grind size. In advanced semi-automatics, you can even control temperature and brewing time. In other words, a semi-automatic lets you experiment. Consequently, the espressos you brew become tastier as your skills grow. When you shop for a semi-automatic, the number of controls and the degree of control are important considerations. But, what if you’re not interested in learning the ins and outs of brewing coffee? What if you only care about the result and not the process? Well, if that’s the case, a super-automatic is your ticket to a tasty espresso. Basically, a super-automatic decides and does most of the things for you. Low-end super-automatics offer a small menu, leaving little room for custom preferences. High-end super-automatics, however, offer a larger menu, along with plenty of opportunities to customize your experience. Now, you should choose what is more important – control or convenience? Sadly, for home users, you should pick one over the other. If you want both, you should spend thousands of dollars on a commercial espresso machine. Okay, if you’ve made up your mind, let’s move to the factors to consider for each type of machine. What are the factors that I should consider when buying a semi-automatic? Grinder: If you’re interested in developing your barista skills, sooner or later, you will need to use freshly ground coffee rather than pre-ground coffee. So, in anticipation of this requirement, choose a machine with a built-in grinder. Temperature Regulator: Maintaining the temperature in the 195° F to 205° F range is essential for extracting flavor from coffee. The machine’s temperature controller plays a big role in accomplishing this task. If you desire a stable temperature profile, choose a machine with a PID controller. Or, at the very least, a machine that has separate thermostats for steaming and brewing water. Heating System: The heating system increases the temperature of the water from the reservoir for steaming or brewing. Non-commercial machines use a thermo block heating system. The disadvantage of this system is that you can’t steam and brew at the same time. Also, there’s a switching time between steaming and brewing. However, many manufacturers reduce the switching time using features such as auto-purge or dual thermostats. Filters: Filters for the portafilter may be single-walled or double-walled. They are also known as pressurized and non-pressurized filters. If you’re grinding your own coffee, you need a non-pressurized filter. If you’re using pre-grounds, you need a pressurized filter. Also, if the machine has a single shot and a double shot mode, make sure you get a single shot and double shot filter in the pressurized and non-pressurized variant. Control: You should look at control from two perspectives. First, look at the number of controls. The higher the number of controls, the wider the scope for experimentation. Second, look for the degree of control within each control. For example, in two machines with a burr grinder, the one with five settings offers a higher degree of control than a machine with three settings. So, the number of controls provides coarse adjustment and a higher degree of control provides fine adjustment. Steam Wand: Yes, you’re looking for an espresso maker. But, occasionally you may want to treat yourself or others to milk drinks. In that case, you need a steam wand to froth milk. A good steam wand is fast, powerful, and easy to clean. If you’re a beginner, we recommend you go for a pannarello steam wand. Okay, but what if I am buying a super-automatic? When buying a super-automatic, you need to consider the number of pre-programmed drinks and the extent of customization for each drink. For example, a good super-automatic should allow you to adjust the strength and volume of your espresso shot. In addition to customization, look for machines with more automation. Lastly, the machine should be easy to clean and maintain. Also, the points regarding grinder, temperature regulator, heating system, and steam wand apply for super-automatics as well. What you don’t need to worry about is filters and tamping. Another feature to consider is the quality of the interface. If the interface has too few buttons, it isn’t intuitive. If it has too many buttons, it isn’t user-friendly. So, look for the right balance between the two. When you look at the interface, it shouldn’t take you long to figure out what the button does. The inclusion of a display is a huge bonus. Great, I know what type to buy and what to look for. So, what are my options? You’ve acquired a great deal of knowledge related to buying a home espresso maker. Now, you can use the information to choose a product from our top five espresso machines. Alternatively, you can do your own research to explore other options. We suggest you check out products from DeLonghi, Breville, Cuisinart, Mr. Coffee, and Gaggia. 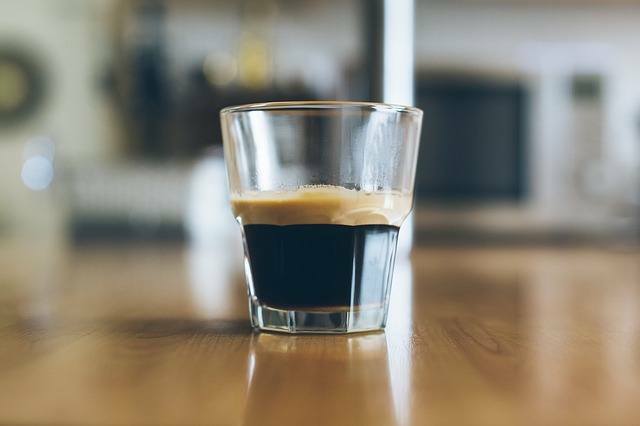 Based on the reviews of home espresso machines and the factors to consider when buying one, you’re probably clear on what type of machine to buy. If you’re going for a semi-automatic, the Breville Barista Express is an excellent choice for home users. However, if you’re looking for a super-automatic, you can’t go wrong with the DeLonghi Magnifica. But, these machines are in the $500+ range. If you’re looking for something more economical, consider the Mr. Coffee ECMP1000 or the DeLonghi EC155. The ECMP1000 is good for espresso and milk drinks. The EC155 is better for people who are the espresso-only type. If you have the right information and guidance, buying a home espresso machine is an easy task, despite the sea of choices. We hope that this guide has answered all the questions that were causing confusion in your mind. And, we hope that the what you’ve learned here will unite you with your best pick at the earliest. Note that we’ve also written a buying guide on commercial espresso machines if you’re looking for a commercial espresso machine.